How Fundamental and Ubiquitous Really Is Metonymy? In the classical theory, metonymy is often defined as a figure of speech which operates on names of things. 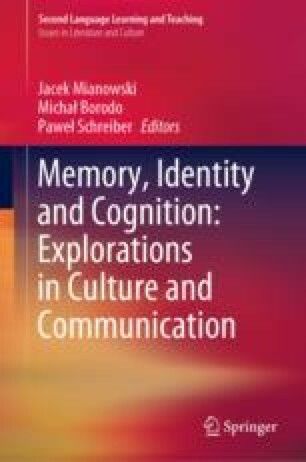 In Cognitive Linguistics, however, metonymy is normally understood as a particular type of mental mapping and a very basic cognitive mechanism (probably more basic than metaphor) rather than a simple linguistic matter (Barnden, 2010; Barcelona, 2003a, b, c, d; Dirven and Pörings, 2003; Goosens, 1990; Haser, 2005; Kosecki, 2007; Nerlich and Clarke, 1999, Nerlich and Clarke, 2001; Panther and Radden, 1999; Panthe and Thornburg, 2004, Panther and Thornburg, 2007; Ruiz de Mendoza, 2003). The first aim of this article is to shed some light on how basic the mechanism is. The article presents metonymy from a broad perspective, incorporating, apart from linguistic, also psychological and biophysical studies. The observations of psychologists (Michotte et al., 1964), biophysicists (e.g., Eagleman, 2001; Nieder, 2002), linguists (e.g., Gardner & Gardner, 1969; Kwiatkowska, 2007), or even technologists (e.g., Klein, 2008) lead to the conclusion that the mechanism of metonymy is indispensable to perception and cognition and, as such, is not only characteristic of humans, but has also been developed in other animate beings. Another aim of this article is to demonstrate that metonymy is an omnipresent phenomenon. It is demonstrated that metonymy is frequently used outside language, e.g., in visual arts, that it is used in reasoning and that it may serve the function of providing understanding. Boeree, G. C. (2000). Gestalt psychology. Retrieved from http://webspace.ship.edu/cgboer/gestalt.html. Accessed 20 Dec 2006. Dickson, M. (2008). Goodall makes the top 200—but his face doesn’t fit for Davis Cup. The Daily Mail, August 27, 2008. Retrieved from http://www.dailymail.co.uk. Accessed 12 Feb 2009. Jones, C. (2008). Retrieved from http://www.courtjones.com. Accessed 25 May 2009. Klein, J. (2008). Retrieved from http://blog.ted.com/2008/05/joshua_klein.php. Accessed 12 July 2009. “Metonymy”. (1985). In Encyclopaedia Britannica. Retrieved from http://www.britannica.com. Panther, K. U., & Thornburg, L. (2004). The role of conceptual metonymy in meaning construction. metaphorik.de (pp. 91–116). http://www.metaphorik.de/06/pantherthornburg.pdf. Accessed June 2004.